Volcanoes are undeniably home to some of the most beautiful landscapes on Earth. It doesn’t take much imagination to picture slopes of exceedingly fertile mineral rich soils, covered in lush vegetation; high peaks punching through cloud cover offering stunning vistas and bubbling pools of geothermally warmed waters were one can soak ones worries away. What about strikingly coloured crater lakes? 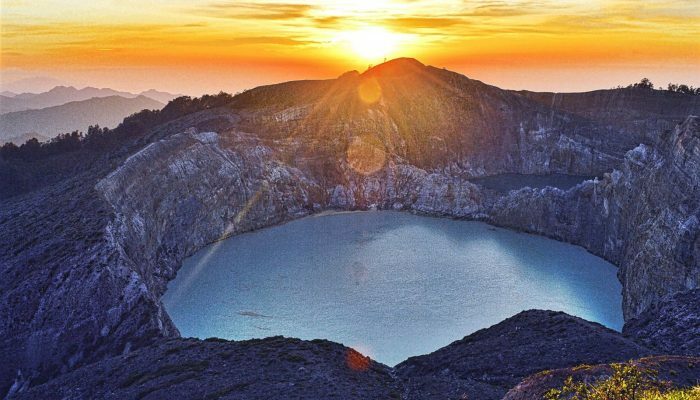 You’ll have to travel to Kelimutu volcano, on the Indonesia island of Flores, to catch a glimpse of those. But the journey is guaranteed to be worth it. Picture three deep pools of water, at times turquoise blue; at others emerald green and even blood red! The andesitic to basaltic (this simply means that the rocks which form the volcano are depleted in silica, sodium and potassium bearing minerals – compared to other types of igneous rocks that is – and you’ll predominantly find pyroxene, plagioclase and hornblende in them) volcano is capped by the three colourful lakes, formed as a result of a powerful ancient volcanic eruption. In stratovolcaones (those which are cone shaped) the intensity of an eruption(s) can be so great that once all the magma, ash and rock in a caldera is erupted the edifice can no longer hold itself up and collapses in on itself, in a process known as a caldera collapse. When this happens, it is not uncommon for the crater left behind to gradually fill with water, both from within the volcano and from precipitation and other external sources. What is unusual about the Kelimutu lakes is that they are very striking in colour, and even more remarkably, their colour changes over time! It is of great interest to geologists since it is rare that these lakes can have different colours even though they are from the same volcano and are located side by side at the same crest. According to Indonesian folklore, these lakes are the resting places of the ancestors of the Indonesian people. Tiwu Nuwa Muri Koo Fai (Lake of Young Men and Women) – This lake is turquoise. The reason for the changing colour of the waters is hotly debated. Some argue that it is fumaroles beneath the lakes which emit volcanic gases like sulphur dioxide, which are to blame. The fumaroles create upwelling within the lakes, forcing denser mineral rich water from the bottom of the lakes upwards and this interaction causes the visible colour changes in the lake. Others argue that it is the changing levels in the oxygenation, as a result of the injection of volcanic gases, of the waters which drives the colour fluctuations. While the mystery is resolved, all that is left is to visit the enigmatic lakes, as Danielle Su (author of today’s imaggeo on Mondays image and researcher at the University of Western Australia) did. Danielle’s research typically deals with upwelling around oceanic islands in the Indian Ocean so it was exciting to see the parallels of the upwelling mechanism replicated within these volcanic lakes. ‘Upwelling generates high primary productivity in the ocean by bringing deep nutrient rich water to the surface and can be identified in remotely sensed data by the colour of the phytoplankton chlorophyll-a signatures. Although the source and output is different, the physics is similar and I really enjoyed finding this similarity in such different environments,’ describes Danielle. The morning hike requires some commitment but the view from the peak makes it all worthwhile as the first rays of sunlight casts a glow over the volcano’s summit lakes.